The group of visiting boys on the balcony of the Port of Ngqura’ Admin Building overlooking port activities. Transnet National Ports Authority (TNPA) joined the Department of Basic Education and corporate South Africa in observing the national Tomorrow’s Man initiative, with the port landlord’s head office and certain ports opening their doors to dozens of male learners. Tomorrow’s Man, spearheaded by national vehicle tracking company, Tracker, is aimed at empowering and developing high school boys, by exposing them to positive role models, career guidance and the working world. It was formerly known as The Men in the Making programme. The boys hosted by TNPA were a mix of employees’ sons as well as previously disadvantaged learners from TNPA’s adopted high schools across the country. TNPA’s Adopted Schools programme is designed to build the Authority’s capabilities within the ports by developing mission critical skills within its communities from the ground up. TNPA’s full-day programme included career shadowing and practical exposure to business and port operations. The boys gained insight into the port system and the wide range of career opportunities it offers. Volunteer mentors within TNPA have also been asked to offer continued guidance and inspiration for the Grade 10 to 12 boys for up to three months after TNPA’s Tomorrow’s Man participation. “We want to extend the impact of our participation so that it isn’t just a once-off interaction with the boys, but an opportunity for us to provide boy-children in South Africa with ongoing attention, help, recognition and acknowledgement,” said Montjane. TNPA representatives encouraged the learners to work hard at English, Pure Mathematics and Physical Science at high school level, which are required for many of the mission critical roles in the maritime industry. Head Office in Parktown – 30 learners from Gauteng Province’s first maritime school – the Mohloli Maritime School in Sharpeville, Vereeniging – were treated to various presentations and lunch and were invited to share their feedback with peers at the end of the day. 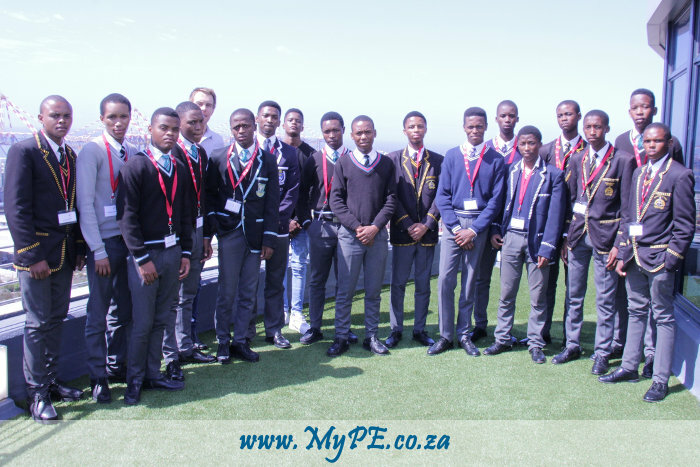 The Port of PE hosted 18 learners from eight different schools in the city on 14 March as part of the Tomorrow’s Man initiative. They attended various presentations, job shadowed various people, enjoyed lunch and received certificates for attendance. They visited the Port Control Tower for an overview of the port and watched a vessel sailing. The Port of Ngqura hosted 20 learners from four different high schools in Nelson Mandela Bay – the Cingani Masiphatisane-, Ndzondelelo-, Westering- and St Thomas High Schools on 15 March. They were guided through different careers within the port system and shadowed by various people based on their career aspirations. Engineering and Accounting were their favourite careers, followed by IT. The Ports of Durban and Mossel Bay will host their groups of boys on Wednesday, 27 March.